Reaching Pistoia by car is like visiting a painting museum: hectares and hectares of nursery gardens stretch around you as far as the eye can see and between spring and autumn become an explosion of colours. 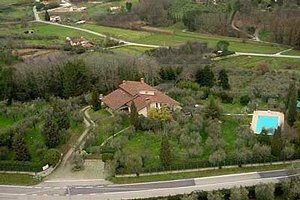 So, if you are planning to spend your holidays in the heart of Tuscany, why do not you choose one of the many villas in Pistoia that our agency has selected for you? With its warm Tuscan rustic style (terracotta-tiled floors, beamed ceilings, fireplaces in the living area...), often provided with a private swimming pool, immersed in nature and overlooking breathtaking panoramas, a villa in Pistoia offers the possibility of combining nature, culture, peace and privacy. In fact, for adults a villa in Pistoia means not only the opportunity of buying plants, flowers and bonsais in the already mentioned nursery gardens, but also the possibility of attending many blues concerts at the beginning of summer (in the past important artists, such as Frank Zappa, B. B. King, the Deep Purple and Bob Dylan have sung in Pistoia) or of visiting other Tuscan cities of art (Pisa and Florence are just a few kilometres away); children, instead, can visit Pistoia Zoo (600 animals living in a 7-hectare area) or Collodi, the town of Pinocchio, the most famous puppet in the world! Do not waste time, then: look at the villas in Pistoia we have selected for you and choose the one that best fits your needs. Have a nice holiday in Pistoia ! 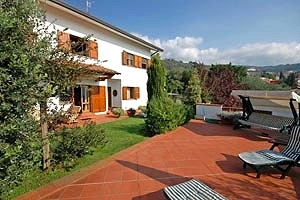 Beautiful villa in scenic location on a hill overlooking a valley in the province of Pistoia, near Montecatini Terme. Sleeps 8, swimming pool, Internet connection, air conditioning, wood-burning oven. Thermal baths and golf club nearby. Outstanding luxury villa with swimming pool situated in a peaceful location and surrounded by wonderful century-old pine and oak trees in Lower Valdarno, near Fucecchio (Florence). Sleeps 11, air conditioning, whirlpool facilities and Internet connection. Riding stable, restaurant, wine shop, tennis courts and wellness centre in proximity to the villa. Montecatini Terme and its thermal baths within a few kilometres. Luxury and elegant historic villa dating from the early 19th century. The villa is situated in Valdinievole, near Montecatini Terme (Pistoia). 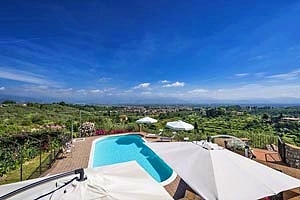 Situated in panoramic position, it offers a wonderful view of typical Tuscan countryside. Sleeps 10+2, wide garden, swimming pool, barbecue equipment, Internet connection. 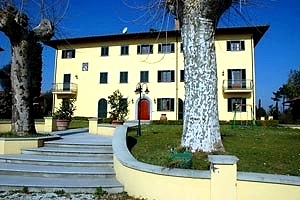 Holiday villa in Larciano (Pistoia), in Valdinievole. 18 sleeping accommodations, private swimming pool, panoramic view, barbecue, golf course and tennis courts in the neighbourhood. 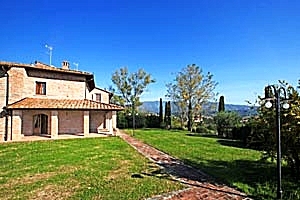 Holiday villa in Empoli countryside, between Vinci (Florence) and Lamporecchio (Pistoia). 5/7 sleeping accommodations, swimming pool, garden, barbecue, Internet connection, satellite TV, parking. 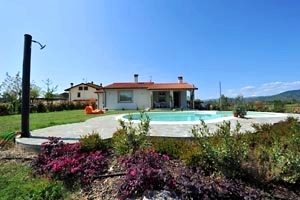 Villa with pool in Valdinievole, at a close distance from the famous thermal town of Montecatini Terme (Pistoia). Sleeps 10+1, wide garden, whirlpool facilities, barbecue and small gym. Villa with pool near Pistoia, in Valdinievole. The villa is situated close to the famous thermal towns of Montecatini Terme and Monsummano Terme. Sleeps 9+2, swimming pool, Internet connection, air conditioning, toys for children. Tennis club, riding stable and golf club nearby. Elegant ancient countryside villa dating back to the 19th century with 12/19 sleeping accommodations. 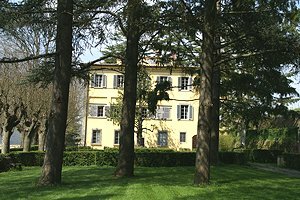 The villa is in Serravalle Pistoiese, just a few kilometres from Pistoia, in the Valdinievole region. Exclusive use of garden and swimming pool; 20-hectare estate covered with vineyards and olive groves. Internet. The villa is fenced.